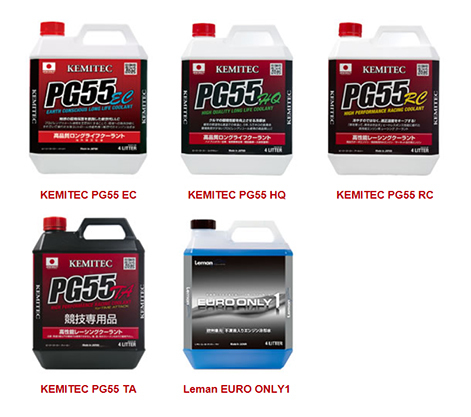 KEMITEC Co., Ltd is a manufacture of LLC (Long Life Coolant) in Japan and No.1 share in Japanese coolant market. They would like to expand their business in overseas market and also they would like not only all car owners but also motor bike owners, jet-ski owners, ship owners and snowmobile owners to know how KEMITEC brand coolant is safety, good performance and gentle to the environment Please contact to us if you are interested in or having any questions. KEMITEC Co., Ltd one of famous Long Life Coolant manufacture in Japan is looking for distributors in Taiwan, China (except Shanghai), Philippines, Thailand.Singapore, Malaysia, Indonesia. Please contact to us if you are interested in or having any questions. PG55 series has sociality, prospect, marketability, profitable and reliance as well. A stabilization of benefit will be expectable with KEMITEC products. Our products are made with Propylene glycol which is safety for human’s health and green environment. Still other coolant manufactures are using Ethylene glycol which specification has an acute toxicity for not only human being but also other animals. One 1 tea spoon can kill cat. KEMITEC sells safety products to all over the world through our distributors in each country. If you have a sales network in your country, please feel free to contact us. 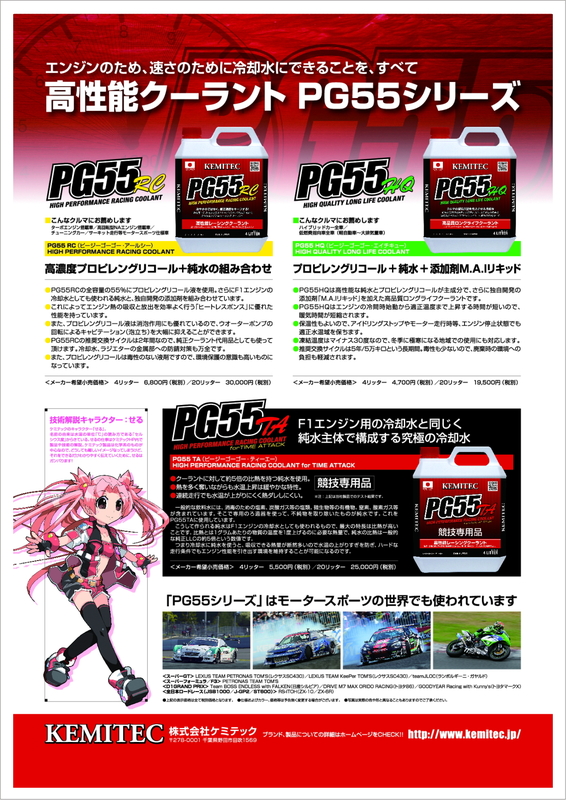 Recently the way of thinking, usage and positioning for engine coolant has been changing by Japanese consumers. To manage the water temperature of engine will pull the best performs of high performance engine. 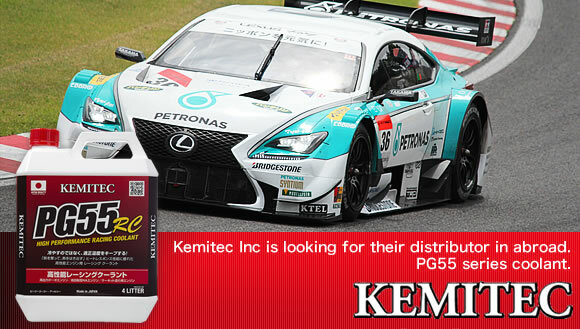 KEMITEC Inc would like to suggest PG55 products to all consumers in race users and daily car users. Leman EURO ONLY 1 is a high grade Long Life Coolant special for European vehicles even petrol engine or diesel engine. The main component of Leman EURO ONLY 1 are high quality pure water and high concentration propylene glycol. We have formulated our coolant in the best condition so please do not use without diluted with water. Comparing with other coolant, the deterrent effect of Leman EURO ONLY 1 works to prevent from a cavitation generates. EURO ONLY 1 does not contain any components to damage pathway inside radiator, gasket and seals. The frozen temperature range is -30 degree Celsius so good for cold place too. The usual LLC chargers are vacuum injector methods like single stage method or 2 stage method before. There were cases which air vent was not complete depending on the pipe structure and radiator. – 0.098MPa vacuum condition. This makes taking air out from waterways inside the engine. © Copyright 2015 KEMITEC Co.,Ltd. All Right Reserved.